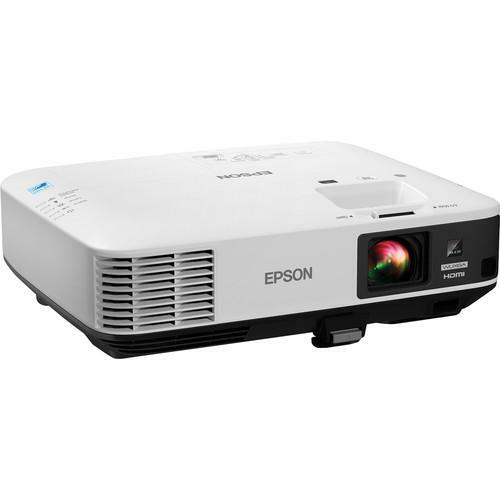 We recommend checking out our discussion threads on the Epson Epson PowerLite 1985WU WUXGA 3LCD Projector V11H619020, which address similar problems with connecting and setting up Multimedia Projectors . The user manual for the Epson Epson PowerLite 1985WU WUXGA 3LCD Projector V11H619020 provides necessary instructions for the proper use of the product A/V Presentation - Projectors - Multimedia Projectors. Optimized for boardrooms, classrooms, and other presentation applications, the PowerLite 1985WU WUXGA 3LCD Projector from Epson features a brightness of 4800 lumens and a native resolution of 1920 x 1200 (WUXGA). To provide flexibility in terms of placement relative to the screen, it features a 1.6x optical zoom with a 1.38 to 2.28:1 throw ratio. Offering HDMI and analog connectivity, it can be connected to a variety of video sources, plus there is USB for direct plug-and-play connection to a Mac or Windows computer. Additionally, a second USB port lets you project directly off a flash drive or other USB storage device. A wireless link enables projection from Android mobile devices or Intel-based products with WiDi support - and the ability to connect up to 50 devices using the EasyMP Multi-PC software for multi-user, collaborative interaction. As noted, the projector features two HDMI inputs for computers, HDTV appliances, document cameras, HDMI-enabled mobile devices, and more. One of the HDMI inputs features MHL support, meaning it can power a compatible mobile device through the same connection used by the HDMI signal. For legacy analog devices, there are two VGA inputs, plus a single VGA output so that one of the VGA signals can be passed along to a monitor, second projector, or other secondary display. A composite input allows VCRs, DVD players, SD camcorders, and other analog SD equipment to be connected. Finally, there are three analog audio inputs, one on RCA connectors that is paired with the composite input, and two on 3.5mm connectors to accompany the VGA inputs. There is also a 3.5mm output that pairs with the VGA output. A 16-watt built-in speaker provides audio output for times when separate audio is unavailable. An IR remote is included for local control or you can use buttons on the projector itself. There is also RS-232 for operation from automation systems like Crestron or using custom software. An Ethernet port enables Web-browser operation and projection across a local network. If you own a multimedia projectors and have a user manual in electronic form, you can upload it to this website using the link on the right side of the screen. Box Dimensions (LxWxH) 20.787 x 14.409 x 8.189"
The user manual for the Epson Epson PowerLite 1985WU WUXGA 3LCD Projector V11H619020 can be downloaded in .pdf format if it did not come with your new multimedia projectors, although the seller is required to supply one. It is also quite common that customers throw out the user manual with the box, or put the CD away somewhere and then can’t find it. That’s why we and other users keep a unique electronic library for multimedia projectorss, where you can use our link to download the user manual for the Epson Epson PowerLite 1985WU WUXGA 3LCD Projector V11H619020. The user manual lists all of the functions of the Epson Epson PowerLite 1985WU WUXGA 3LCD Projector V11H619020, all the basic and advanced features and tells you how to use the multimedia projectors. The manual also provides troubleshooting for common problems. Even greater detail is provided by the service manual, which is not typically shipped with the product, but which can often be downloaded from service. If you want to help expand our database, you can upload a link to this website to download a user manual or service manual, ideally in .pdf format. These pages are created by you – users of the Epson Epson PowerLite 1985WU WUXGA 3LCD Projector V11H619020. User manuals are also available on the website under A/V Presentation - Projectors - Multimedia Projectors.